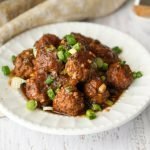 These low carb Mongolian beef meatballs will satisfy your craving for takeout food. Eat over cauliflower rice or take to your next party as a low carb appetizer. Only 2.4g per 10 meatballs. In a small bowl, mix the molasses and Swerve sweetener to make a brown sugar. In a large bowl, mix beef, pork, 1/2 teaspoon of grated ginger and 1 teaspoon crushed garlic. Form into meatballs and set aside. In a large oven proof skillet, add oil and brown meatballs. Take out meatballs and add soy sauce, 1/4 cup water, 1 T garlic, 1 t grated ginger and brown sugar mixture. Whisk to combine and incorporate brown bits from meatballs. Add back meatballs and place in oven to bake for 20 minutes. Take out of oven and toss with green onions. If you wish a thicker sauce, you can mix 1 teaspoon of glucomanon powder with 2 Tablespoons of water and then mix in with sauce. Cook of medium heat until the sauce thickens.